Still on target for severe storms for Sunday in the Midwest. 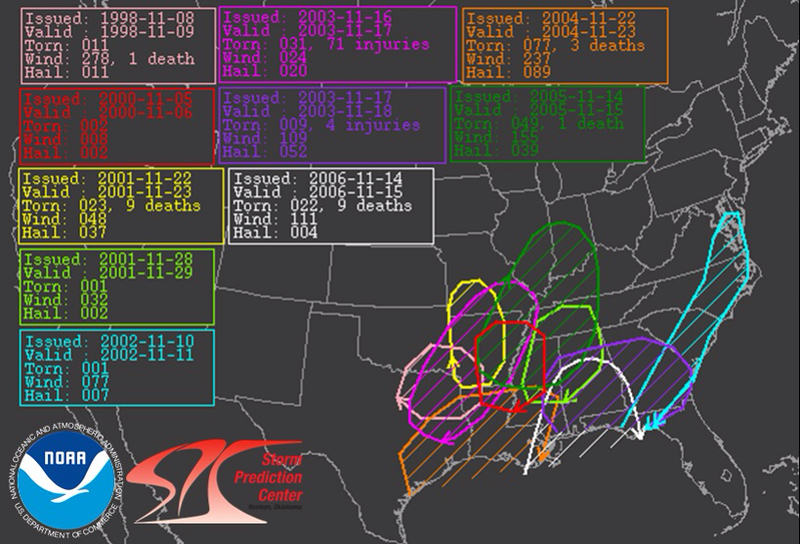 Day 2 Moderate Risks do not happen very often, but they all have produced severe weather, some more dangerous than others. The main threat with tomorrow's storms will be the winds. The above image shows winds over 30 miles per hour for the afternoon and early evening. 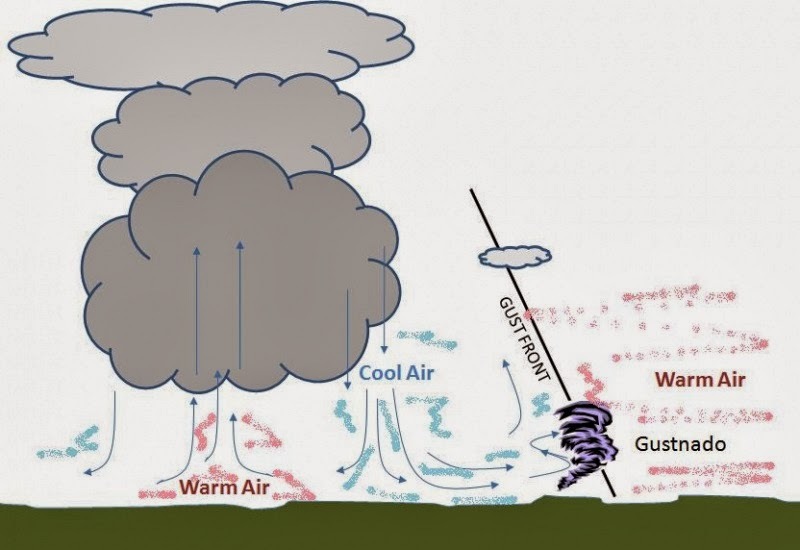 The winds will be the big story, but we could also see some tornadoes. I grabbed this image from Skybrary. 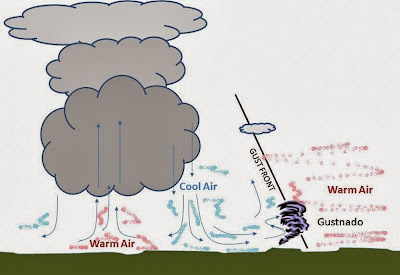 A gustnado is formed ahead of the storm when the winds that kick out with the gust front. They are normally weak and short-lived, but still can do some moderate damage. With the winds as strong as they are expected... I would not be surprised with a few of these with tomorrow's event. I am not trying to put fear in anyone, but please be prepared and have some way of getting warnings tomorrow. 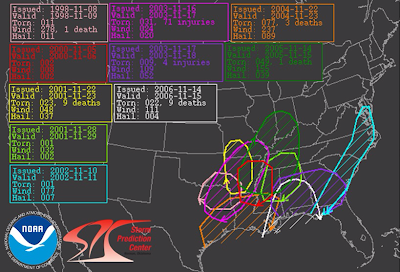 And most importantly, take the warnings serious and get to shelter if it is in your area. I HIGHLY recommend our "Ohio WX" app for Android and Apple products. Just search "OHIO WX" and it will pop up. It will alert you for a Tornado Warning... wherever you are thanks to GPS. ---Sunday Early AM: Scattered showers, breezy, winds 10-15 MPH. ---Sunday Late AM: Scattered showers, few rumbles, becoming windier, winds 10-20 MPH. ---Sunday Midday: Showers breaking up with a few dry spells, winds 15-25, gusts 30+ MPH. ---Sunday Early Afternoon: Windy, few lingering showers, winds 15-25+, Gusts 35+ MPH. 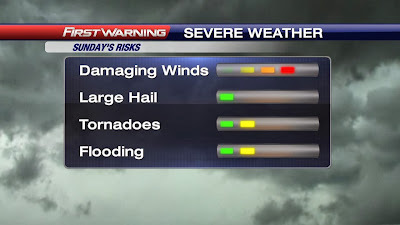 ---Sunday Late Afternoon: Windy, isolated storms developing, winds 20-30+, Gusts 40+ MPH. 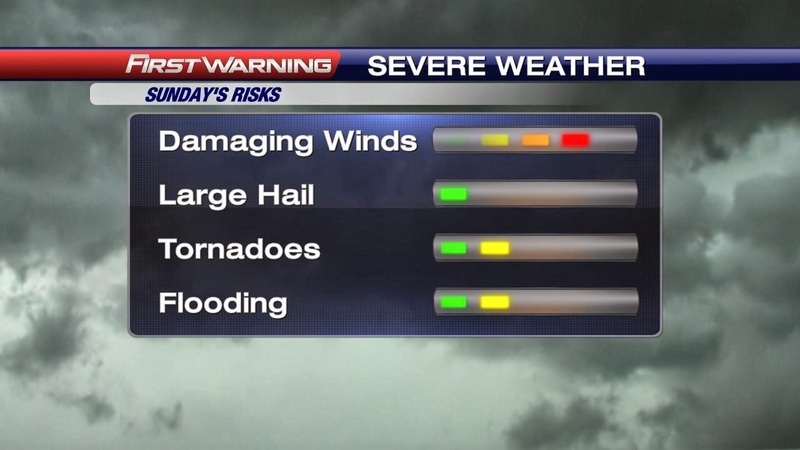 ---Sunday Evening: Windy, isolated strong storms ahead of a line of storms, winds 20-30+, Gusts 50+ MPH. Even higher gusts with the leading edge of the line of storms. ---Sunday night after midnight: Storms quickly push east and we begin to dry out, staying breezy, winds 10-20 MPH with gusts dying down. PLEASE be alert, let others know, and stay tuned to the forecast for any changes. Gotta get back to prepping my show. Have a good one!